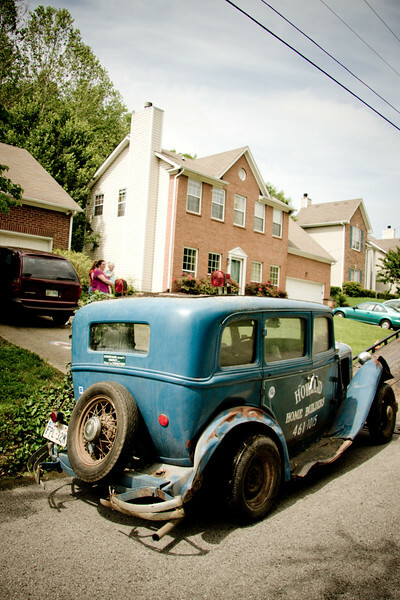 A 1932 Dodge DL has been in my family since it was purchased new in 1932. I'm the 5th generation to own it. My son would be the 6th, but for now, I've given it back to my father, to have when he returns to the United States. Dad's a missionary to France, and he and Mom have lived there since 1981. (I did too, from 1981 to 1991.) These are photos of the Dodge's trip out to the countryside, for storage until then. In the 70's, in Rhodes Island, Dad ran a construction company from this 1932 Dodge. He replaced the Straight-6 engine with a Ford 302 V8 and the cloth top with plywood. And he painted it Rustoleum blue. All upholstery is original and it shows. My car in college, I totaled a station wagon with it, so the front fender has a dent. It still says "Howland Home Builders" on the sides.